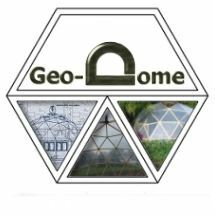 Any geodesic sphere that has an even frequency (2v, 4v, 6v etc) can be divided in two to produce a dome that is exactly half a sphere. But when it comes to odd frequency domes like 3v and 5v it can get a bit tricky, 3 frequency domes are very popular because they look smoother than a 2v dome but don’t have the complexity of a 4v so a lot of people come across the 3v flat base issue. 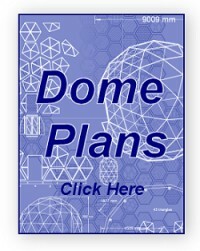 If a 3v dome were cut in half the dividing line wouldn’t be exactly half a dome, take a look at the diagram below. 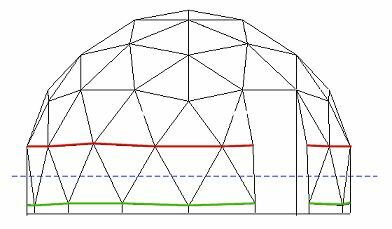 The blue line shows the line that would divide a sphere exactly in half, this line cuts through all the base triangles and isn’t really a satisfactory way of finishing the bottom of a dome, so what most people do is decide if they need a taller or shorter dome and cut the dome at the red line for a 4/9 dome or the green line to create a 5/9 dome. This all sounds fine but we’re left with a problem to solve. The dividing line at the 4/9 and 5/9 cut is now not straight so the dome won’t sit flat on the ground. There are a number of ways to solve this including adjusting the strut lengths on the bottom triangles, using a fillet and changing the dome orientation, I’m not keen on changing strut lengths as it adds complexity to an otherwise simple design so I’ll explore the later two as possible solutions. A simple fix is to add a tapered fillet that makes up the difference required to make the base flat. On a 4.5 meter dome this is 35mm so you would need a fillet that runs from nothing to 35mm fitted on every hex base strut (Strut ‘c’ on the dome calculator) for a 4/9 dome. On a 5/9 dome a solid base is added because the 35mm slope is going the opposite direction cutting a 35mm to nothing sliver off the base beam is needed, the diagram below shows a dome laid out horizontally to better demonstrate which struts need packing. Another fix for this problem is to simply rotate the dome until a convenient dividing point is reached. Some of the base triangle will need to be cut in half but this is still much easier than changing strut lengths. The diagram below shows a 3v dome that has been rotated 90 degrees then divided along a line exactly through the centre, this solution has the added benefit of producing an exact half sphere. I am planning to construct a small lean-to greenhouse with a height of 2metres. How can I design it as a 1/4 sphere (if that is the right term.....I am a complete novice as far as domes are concerned) with straight edges for fixing to the ground and the back wall? Material for construction will be 2x1 timber using hub and strut method. There's lots of ways to do a quarter sphere. Which you choose is a combination of what you want it to look like and which of the various complications you're more comfortable with. An icosa dome has a minimal number of parts, but you'll need some custom work because it doesn't naturally cut into a quarter sphere, although it's only a matter of dividing facets in half. The 3v has managably small panes, but it won't be twice as long as high because it doesn't sit on a mid-plane, which also means you need a small amount of packing to sit it down flat. Both the 2v and 4v sit flat on a mid plane, but the 2v isn't as pretty and the 4v is a little more complicated. An octa dome splits naturally into a quarter sphere so there's no custom hubs with tight angles and you might prefer how it looks as a lean-to, but it has a much greater varity of strut length and pane size so in that respect it's more complicated than an equivelent icosa. Thanks Simon. Have been busy with cardboard and glue making models of various designs. Trying to get a something that does not have too shallow an angle on the walls.....perhaps I should go for more than 1/2 diameter for the height? Sorry to show my ignorance but what is the difference between icosa and octa. 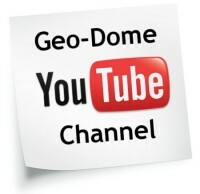 Geodesic domes are mostly based on the 20-sides icosahedron, and its equilateral triangular faces are divided up into smaller facets - the frequency of the dome tells you how - 2v gives 4 facets, 3v gives 9, etc - and then the corners of those facets are all projected out to the same radius to make a sphere. An icosahedron is a good basic solid because it already has 20 faces and that makes icosa domes rather efficient. But the principle works for any platonic solid - tetrahedron, cube, octahedron and dodecahedron too. 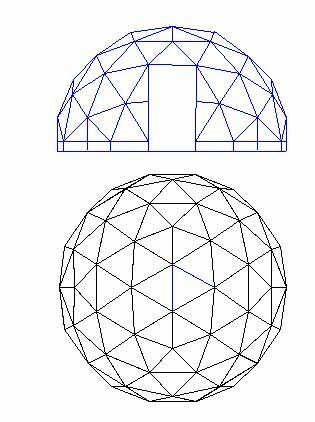 The down-side with the icosa dome for your design is that the icosahedron doesn't have orthogonal axes of rotational symmetry so it doesn't split into a quarter-dome along its struts, whereas the octahedron does. Hi everyone! Does anybody know how to calculate the fillet height (to get a flat base)for any given radius of a 3V dome? I mean, using a formula rather than 3D cad. Thanks! Take the radius of the dome ( in millimeters) and divide it by 67.77 this will give you the height of the fillet required in millimeters. You'll need to take off this amount for a 5/9th dome.